The tandem satellite launch marked the fourth Ariane 5 flight of the year, and Arianespace’s seventh mission of 2017, deploying a spacecraft shared by the Greek and Cypriot operator Hellas-Sat and London-based Inmarsat and a payload built and owned by the Indian Space Research Organization. 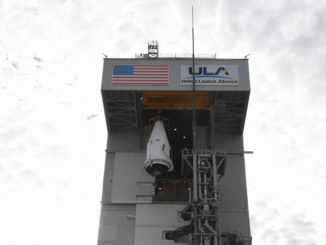 The nearly 180-foot-tall (55-meter) rocket blasted off at 2115 GMT (5:15 p.m. EDT; 6:15 p.m. French Guiana time) after a 16-minute delay to allow the Arianespace launch team time to finalize final countdown preparations. Rocketing into a partly cloudy sky shortly before sunset, the Ariane 5’s guidance computer directed the launcher east from the northeastern coast of South America before it dropped two side-mounted solid rocket boosters into the Atlantic Ocean just after the flight’s two-minute point. 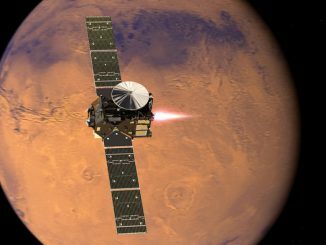 The Ariane 5’s Swiss-made nose cone jettisoned in the fourth minute of the flight, and the core stage’s Vulcain 2 main engine, guzzling a mix of liquid hydrogen and liquid oxygen fired for nine minutes before giving way to an HM7B upper stage powerplant for the final maneuver to enter orbit. The launcher intended to drop off the Hellas-Sat 3/Inmarsat S EAN and GSAT 17 communications satellite into an egg-shaped transfer orbit with a perigee, or low point, of 155 miles (250 kilometers) and an apogee, or high point, of 22,236 miles (35,786 kilometers). The drop-off was inclined around 3 degrees to Earth’s equator. Arianespace said the Ariane 5 reached an on-target orbit before releasing the two satellite passengers, first the 12,742-pound (5,780-kilogram) Hellas-Sat 3/Inmarsat S EAN spacecraft, which launched in the upper position inside the rocket’s dual-payload accommodation. The Indian-built 7,665-pound (3,477-kilogram) GSAT 17 communications satellite separated second. Officials with Thales Alenia Space, the manufacturer of the Hellas-Sat 3/Inmarsat S EAN satellite, and the Indian space agency confirmed ground controllers established contact with both spacecraft soon after arriving in space. The launch closed out a successful first half of 2017 for Arianespace, which had its launch campaigns in French Guiana halted more than a month in March and April by a general strike by local workers. 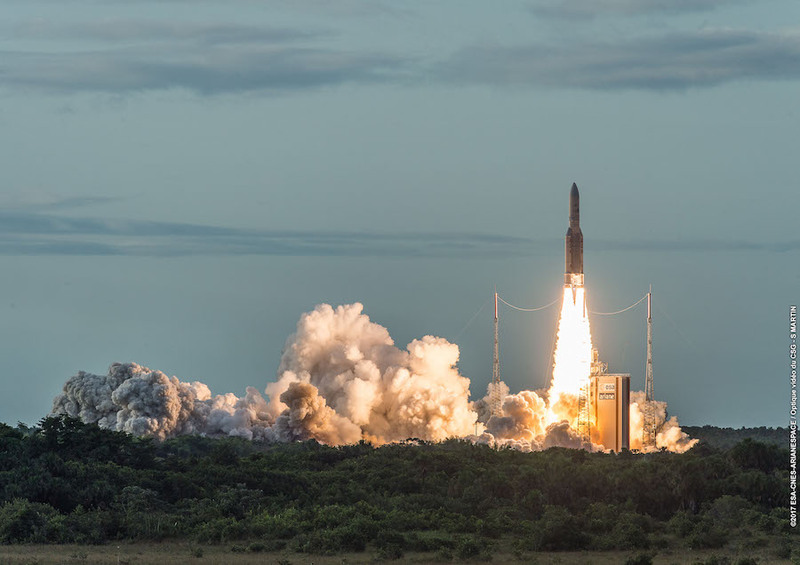 Arianespace resumed launchings May 4, and Wednesday’s mission was the French launch company’s fourth rocket flight in eight weeks. 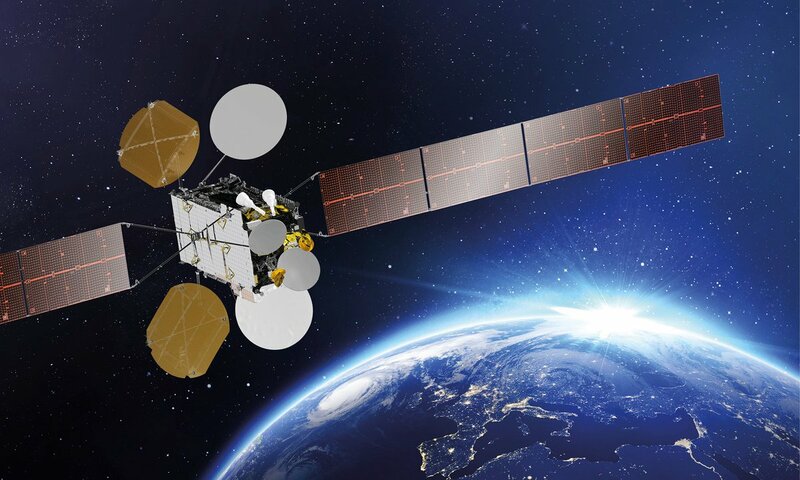 “Arianespace is delighted to announce that Hellas-Sat 3/Inmarsat S EAN and GSAT 17 have been separated as planned in the targeted geostationary transfer orbit,” said Luce Fabreguettes, executive vice president of missions, operations and purchasing at Arianespace. The satellites will fire on-board thrusters in the coming days to circularize their orbits nearly 22,300 miles (35,800 kilometers) over the equator, where they will hold position over a fixed spot on the planet in geostationary orbit. Developed in a cost-sharing arrangement by Hellas-Sat and Inmarsat, the mission’s larger payload will broadcast direct-to-home television programming over Europe, Africa and the Middle East with 44 Ku-band transponders and a Ka-band payload owned by the Hellas-Sat, a telecom provider based in Greece and Cyprus. It will expand and eventually replace broadcast capacity currently offered by the Hellas-Sat 2 satellite launched from Cape Canaveral by an Atlas 5 rocket in May 2003. 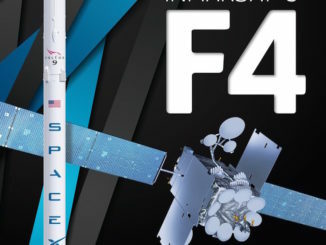 The S-band payload on the Hellas-Sat/Inmarsat S EAN spacecraft will connect airline passengers traveling across Europe with Wi-Fi as a centerpiece of Inmarsat’s European Aviation Network. The European Aviation Network will have coverage in all 28 European Union member states, plus Norway and Switzerland. The aeronautical communications project is a partnership between Inmarsat and Deutsche Telekom, which provides a network of approximately 300 4G ground sites, allowing a computerized controller aboard aircraft to automatically switch between ground and satellite Wi-Fi service as needed. Passenger jets operated by British Airways, Vueling, Iberia and Aer Lingus will be among the first to go live in the European Aviation Network. Heading for an operating position at 93.5 degrees east longitude, GSAT 17 is the heaviest Indian-built spacecraft ever built, according to Prakasha Rao, GSAT 17 launch campaign manager at ISRO. K. Sivan, director of India’s Vikram Sarabhai Space Center, said GSAT 17 is the third Indian communications satellite to launch in the last 50 days. It also caps a busy June for ISRO, which launched the maiden orbital test flight of its largest rocket, the GSLV MK.3, June 5 and deployed 31 Indian and international satellites in orbit on a Polar Satellite Launch Vehicle last week. Arianespace’s next launch from French Guiana is set for Aug. 2 at 0158 GMT (Aug. 1 at 9:58 p.m. EDT), when a lightweight solid-fueled Vega booster will hurl the Optsat 3000 high-resolution reconnaissance satellite into orbit for the Italian military and deploy a French-Israeli environmental satellite named Venµs. 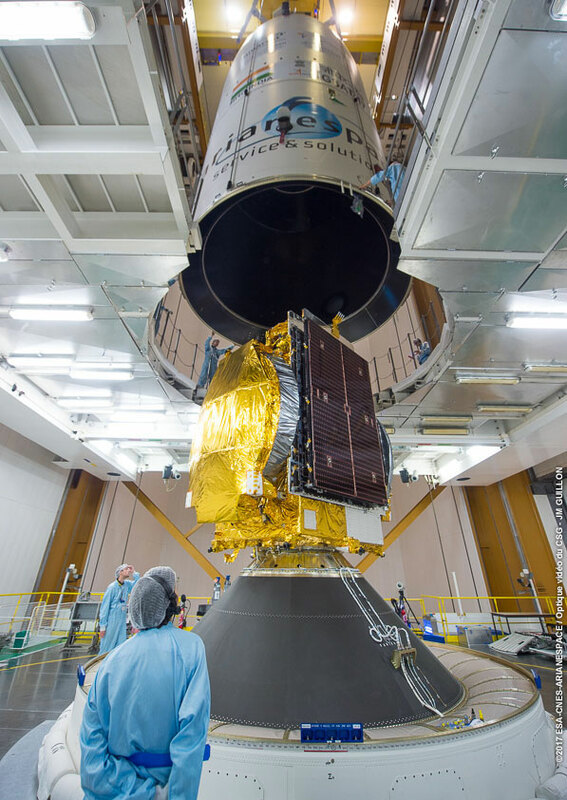 The next Ariane 5 mission is scheduled to lift off Aug. 31 with the Intelsat 37e and BSAT 4a communications satellites.